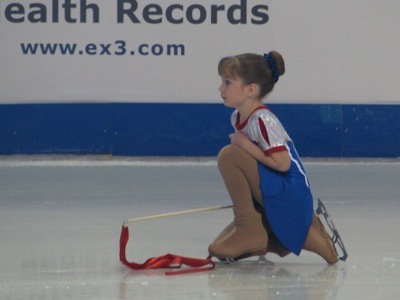 Young skater at the 2010 US Figure Skating Championships in Spokane, WA. Photo by Sue Frause. What great performances the figure skaters gave us last night! I had nary a dry eye as I stayed up late to watch the Women's Figure Skating Long Program of the 2010 Winter Olympics in Vancouver. Kim Yu-Na of South Korea was perfection. Mao Asada from Japan the two triple axel queen. Quebec's Joannie Rochette a vision of blue courage. Here's to the gold, silver and bronze medal winners -- and to Joannie and her father, who tragically lost their beloved mother and wife. She was most certainly smiling down on the ice on Thursday night.